Ever wonder what's in your makeup? No? Well you should. No joke. This is serious. For years I've been using a very expensive cosmetic that I had to special order. I trusted them. And then I looked into what was in it, and I was shocked. After digging a little deeper, it turns out that cosmetics is a whole realm of nastiness, and shockingly, people are oblivious, or they don't care. Here's a thought: anything you put on your skin is in your bloodstream in 30 seconds. Knowing that, can you really put just anything on your skin? Here's another one: the average person uses nine cosmetic/personal care products a day, averaging a daily load of 126 chemicals! With that in mind, I set about finding the purest, non-toxic cosmetic. I'll share the fruits of my labour with you, but first, I want to pass on a little of what I now know. And you should pass this along to every woman you know. In fact, writing this post gave me an idea - I'm going to start a buyer's guide on Pure Green, that covers everything and anything, from mattresses and jeans to make-up and cleaners. This is my first crack at it. First - I'm going to teach you how to read labels. If it says Natural, Biodegradable, Organic or Non-Toxic, don't trust it right away. There are very few rules in the cosmetics industry (in Canada and the U.S. anyway) that govern these terms - a product need have only ONE natural or organic ingredient to be allowed to use the label. In fact, almost 90% of cosmetics are synthetic (and thus harmful), and in the FDA's entire 67 year history, they have only banned 9, I repeat, 9, personal care product ingredients. And don't you believe that chemicals in small doses are ok. Those small doses will accumulate over time and eventually cause problems. Always check for ingredients. If they aren't listed, assume they have something to hide and pass. Second, while there are many, here is a list of the top 12 dangerous, most commonly used ingredients. These are found in everything from soap, lotions, shampoos and hair products, perfumes, make-up, baby products and more. 1. Methyl, Propyl, Butyl and Ethyl Paraben - used as a preservative; mimics estrogen (screws with women's bodies and feminizes male bodies....yikes! ); carcinogenic. 2. Propylene Glycol - a cosmetic format of a product found in anti-freeze, brake, transmission and hydraulic fluid; works as a humectant that helps keep moisture in the skin or product (common in lotions, mascaras and deordorant/anti-perspirant; can cause liver/kidney damage. 3. Sodium Lauryl Sulphate - acts as a foaming agent; the potential side-effects are too many to list. 4. Diathanolamine (DEA) - used as an emulsifier (lotions); while this product alone is not a carcinogen, it reacts with nitrates to form very toxic nitrocamines. Best to avoid. 5. Isopropyl Alcohol - petroleum derived; found in lotions and aftershave in particular; causes headache, nausea and more; destroys intestinal flora. 6. 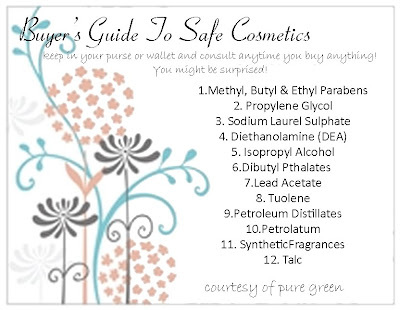 Pthalates - most often used as synthetic fragrances; endocrine disrupter; banned in EU. 7. Lead Acetate - reproductive and developmental toxin; found in hair dye, which is why you shouldn't dye your hair while pregnant. I know this is a tough one, but try going natural (I have been for 3 years and I love it), and try a natural hair rinse instead. 8. Tuolene - usually found in nail polish; reproductive and developmental toxin. 9. Petroleum Distillates - carcinogen; found in perfumes, mascara, lipstick and lip balm. Stay away. 10. Petrolatum (mineral oil jelly) - clogs sking from taking in oxygen; I spotted this in my Carmex, but its commonly found in lip balm. 11. Synthetic Fragrances - most often listed as 'fragrance'; wide range of potential side-effects. 12. Talc - lung irritant; carcinogenic. 5. CoverGirl Fresh Complexion - 8 of 10. Check out the website to see what your favourite product ranks. Now that I've scared you, I'm going to provide a solution! Check back tomorrow for part 2, in which I divulge my favourite, non-toxic cosmetic, and perhaps score a give-away! In the meantime, I've prepared a handy-dandy buyer's guide short format for your wallet or purse. *I have a longer version of the information provided, along with more available, prepared by Tira Wooton. Email me if you'd like a copy. I hope I didn't scare you too badly, but sometimes you just need your cage rattled! Here's to a healthier body and planet! i stopped a couple of years ago, my only problem has been the price difference on items, but then I'm using considerably less personal care products and make-ups. I think it's such a shame that people are so oblivious to what these products are, and how much trust we put in the companies that make them. I may sound like a conspiracy theorist but I'm convinced this is directly related to the increase in cancer over the last 20 years. It bothers me so much to see those damn pink ribbons on products that are messing with our bodies natual chemisty. 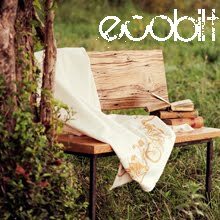 Love the blog (just discovered it today). I also think that the chemicals in products today are terrible. I've always thought that sunscreens are worse for our bodies than the sun and this website confirms it. I just viewed a few pages of your content and found that we have a lot in common (I recently posted about this topic as well) - I look forward to reading more! I am also new at your blog, and I am so greatful I found a blog with such great information. Thanks for the buyer's guide is on my purse!!! I'm waiting with baited breathe for part 2. Good work, and a good mission to get more people aware of what's in their bathroom! On the topic of extending your blog coverage to include other household substances, the very walls of your home can also be a major source of pollutants. I work with a Canadian company that manufactures & distributes low-VOC paints and stains. Let me know if you'd be interested in doing a piece on that stinky subject! Keep on bloggin'! Thank you for all your great comments ladies! I will keep it coming...I promised skin care ages ago. I will work on it. Any other requests? 1. In your post, the term chemical is used as a negative. I would like to point out that everything in our world is a chemical...air, water etc, and this is NOT a bad thing! It's very common to see it used in a negative manner but for the sake of truth and clarity I feel that should be clear. 2. While I agree that certain changes could stand to be made to the Canadian regulations on cosmetics, it is not true that there are very few rules that govern cosmetics. A little bit of research at Health Canada will show you that. I'd be happy to point you in the right direction, in terms of understanding the Canadian regs. :) I know less about the American rules--but still quite a bit! I agree that Natural, Organic etc are marketing terms--they have no legal correlation at all in North America to actual ingredient lists. 3. "In fact, almost 90% of cosmetics are synthetic (and thus harmful)" I would love to know your sources for this statistic and this claim. In mainstream skincare, I would imagine most products are synthetic, yes. I don't believe for a second, though, that all synthetics are harmful. And that goes for cosmetics and other products, too. I think it's important to make sure ALL the substances we use are SAFE. But there's no correlation between safety and synthetic or natural, in a toxicology sense. There are some unsafe synthetics--but there are a lot of unsafe naturals, too!! Synthetic just means man-made or lab-created--I feel that gets clouded sometimes. 5. There are many issues surrounding bias, money trails and data gaps when it comes to the Skin Deep database, the EWG and the Campaign for Safe Cosmetics. Now, everyone will have to make up their own minds as to whether they trust it as a source, but I just feel it's only fair to give people a heads up that these bias issues exist. Sorry that was such a long comment! I'm totally with you on the healthier body and planet.